People or dignitaries may come and go; but the system will continue to always say NO. His Excellency Dr. Pranab Mukherjee, Hon’ble President of Indian Republic was on his two-day visit to the hilly state of Himachal Pradesh. He was here to address Himachal Pradesh Vidhan Sabha which is celebrating its 50th Anniversary. He was also the chief guest at the 20th Convocation of Himachal Pradesh University. He inaugurated the Tagore Gallery at All India Institute of Advanced Studies followed by a visit to Barnes Court (Governor’s House). Some members of student organizations in HPU campus could be seen chatting that the President is an Ex-corrupt politician himself and had no moral right to be the chief guest for the convocation. Had the police cantonment not been there in HPU, we would have shown black flags to the President and agitated against his visit. Whatever may the entire lot think about his visit to HPU, as far as an individual like me is concerned, I feel extremely privileged and honoured to have him in our campus. 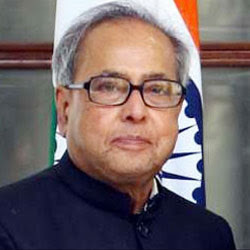 The President of India, by virtue of his position and not his personification, is the topmost person of our country.